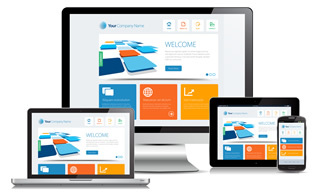 Make sure your website reaches the widest audience by ensuring it works across all devices, regardless of screen size. With more and more people browsing the web on their handheld devices, and this figure continuing to grow, it’s as important these days to have a mobile site as it is a desktop version. It’s even considered by many, including us, that the mobile version of the site is now as important, if not more important, than the standard version. Browsing a website on a mobile is a completely different experience to viewing it on normal PC or Mac, and therefore the interface and usability needs to reflect this. The layout should become more vertical, less important components are to be removed or hidden, and links should be easy to select with the finger. At BIOSTALL we offer two services to get your website up and running on mobiles and tablets. The first option available is to create a separate version of your website that is specifically for mobile devices. When a user visits your website on a handheld device they get redirected to the mobile version, otherwise they remain on the normal desktop site. You may have heard the phrase ‘Responsive Website Design’, or ‘RWD’ flying around the internet recently. RWD is a process whereby the same set of code and templates are used, however the design adjusts based on the screen resolution. It’s a technique that’s become popular over the last year or two and a service we’re proud to offer here at BIOSTALL.